Messages on the Sidewalk: "Midnight"
I first heard "Midnight", one of Jimi Hendrix's little-known pieces, during a sleepover. I was 17 years old. I had heard some of his more popular songs before, but this particular piece (pure music sans vocals) took hold of me and has since never let go. As I listened to Hendrix that evening as he was accompanied by base guitar and drums, it became obvious to me that he had, by capturing the very essence of music on his lead guitar, made the accompaniment by those two other instruments superfluous. Ever since that first encounter, I have sought to translate "Midnight" into words - a futile task, I dare say, for language falls far short in interpreting music. Music cannot be expressed in words. Nonetheless, I will dare to attempt the feat while readily acknowledging my defeat in the end. "Midnight" is unearthly, almost impossible to listen to, not because of any deficiency or lack of quality but because of its superior quality. It brings on a feeling of nausea because of that superior quality. Listening to it is like gazing at the sun. As you follow its every detail it takes you beyond the limits of understanding, beyond the limits of appropriation, into territory no human should venture forth. Beyond those limits is madness, a derangement, a transcendence of logic and rationality, of normalcy. It pushes you to madness and fear, pushing you to the edge, to the event horizon, plumbing the very depths of being. And if such is the impact of the music of "Midnight" on the listener, imagine its impact on its creator. "Midnight" is Jimi Hendrix's taming of music like a wild horse, putting his stamp on it, as with wide, bloodshot eyes, and flaring nostrils it rebels and fights to regain control. "Midnight" is his capture of music like a fish caught on a hook, straining to be free. "Midnight" is captured music that refuses to be imprisoned, that refuses to succumb, to be enslaved. In capturing music, Jimi becomes music - gets caught up in the struggle of the capture in which he and his captive become locked in a struggle to the death, in which none will capitulate until one capitulates or is overpowered and subjugated. "Midnight" is sound raging at its imprisonment, the cry and anguish of the oppressed straining at the chains, agonizing for liberation, seeking release regardless of the outcome, the consequences. 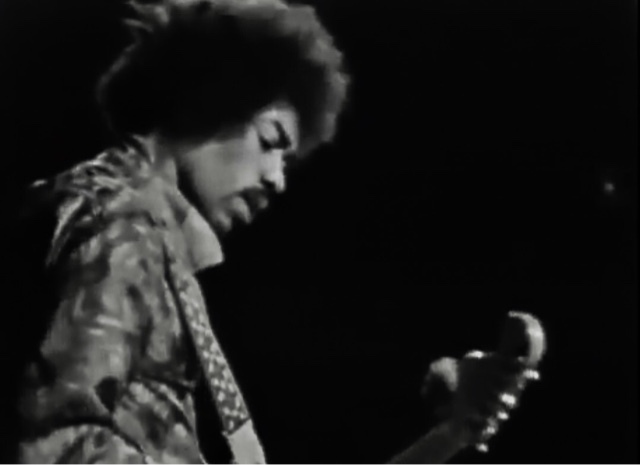 It is my struggle, Jimi's struggle, music's struggle. In the end no one wins, for both capturer and captive are depleted, exhausted. Click on the link below. Put on your headphones or plug in your ear-buds. Crank up the volume way up on this one. Then let Hendrix's "Midnight" take you to the limits and beyond.